MYDRA emerged out of the ashes of another Hamburg band called Charon. After a couple of albums Charon’s line-up changed completely. Their third Album has been recorded between October 87-March 88 at Esquire Music Studio. When the material was nearly ready it was put out to some record companies, Phonogram took the bait although with one condition ‘You have to change the name'. So they changed the band name to MYDRA. After 20 years the Album was remastered and it was surprising how dynamic it still sounded. Of course, nowadays with the digital era there are many more possibilities but that doesn't make it any better. 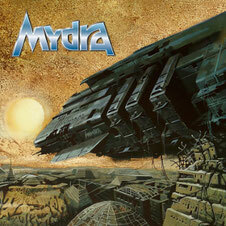 Anyway this album "MYDRA" is released from YesterRock on April 27th, 2012 for the fans of the 80s Rock.